Marked by unsightly patches on the outer layers of skin, psoriasis is more serious than meets the eye. The skin is an expressive organ; it tends to tell us when we’re physiologically or psychologically out of balance. For nail technicians, learning how to “read” the skin of your clients can go a long way toward protecting their health. This includes recognizing psoriasis, an unsightly disorder on the skin and nails that, according to the National Psoriasis Foundation (NPF), currently affects approximately 7.5 million Americans. Here’s what you need to know about this often distressing and potentially serious condition. Psoriasis is considered an autoimmune disease, a fact that differentiates it from other commonly seen skin problems such as eczema, athlete’s foot and dermatitis. It occurs when, for unknown reasons, the body’s natural immune system kicks into overdrive and begins to attack body tissue. Skin cell growth responds by speeding up, and the result is the appearance of thick, red patches and silvery white scales on the surface of the skin. These lesions are most commonly seen on elbows, knees, palms, soles of feet, scalp, lower back and face, although they can also penetrate fingernails and toenails. Although not contagious, psoriasis is chronic and, depending on the amount and locations of body skin affected, has the potential to compromise quality of life. 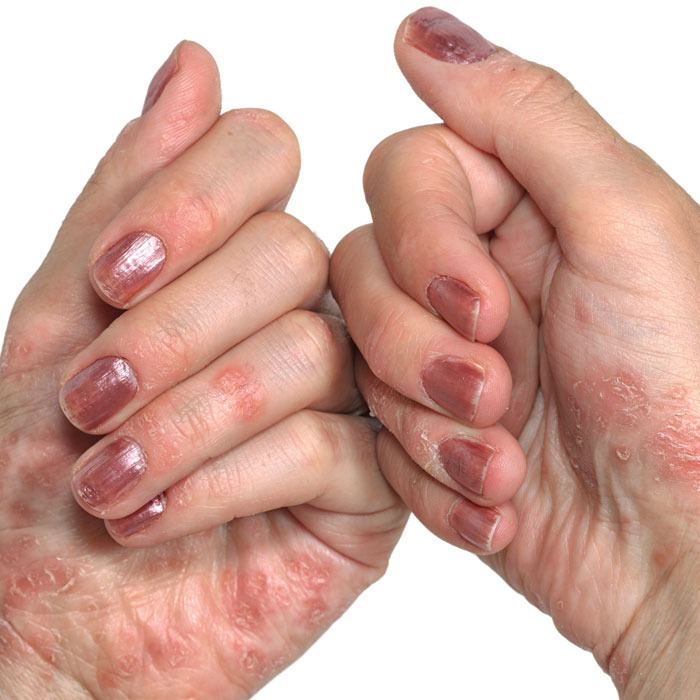 Psoriasis that covers more than 10 percent of the body is regarded as severe, between 3 percent and 10 percent as moderate and less than 3 percent as mild. However, even a mild case of psoriasis can be devastating if the lesions largely appear on highly visible areas of the body. In a recent NPF survey, nearly 60 percent of women with psoriasis reported that their condition interferes with their quality of life. As with all immune disorders, medical science has been unable to pinpoint why some people develop psoriasis and others don’t. However, genetics and environmental factors are causal factors. Scientists have identified specific genetic variants that increase the chances of developing the disease. Indeed, a child whose parents both have psoriasis has a 50 percent chance of developing it as well. Another key risk factor is the immune system itself, which ebbs and flows depending on our general health, environmental exposure and internal stress. It’s not surprising that people with psoriasis often have immunity-affecting health conditions, such as diabetes, heart disease and depression, or that people often develop the disease while struggling with an infection or a prolonged bout of stress. People of all racial backgrounds can develop psoriasis, although it affects Caucasians a bit more frequently than people of color, and often starts in young adulthood. Ten to 15 percent of people develop psoriasis before age 10. In addition to health issues that affect the immune system, there are also some recognized triggers, including injury or trauma to an area, medications, allergies, diet and even weather. Treating nail psoriasis is difficult; injections and even cosmetic repair are used when topicals and light therapy aren’t effective. There are currently new biologic treatments in development, and a recent study at the University of Birmingham in Alabama points to the potential use of gene therapy to restore a normal life cycle to affected skin cells. “For the most part, clients with psoriasis are very aware that they have some type of dermatological problem,” agrees Vicki Malo, president of the North American School of Podology in Toronto. She says it’s up to the nail tech to “practice the three Rs: Recognize, Recommend and Refer,” and advises techs who observe tell-tale red patches to urge clients to see a dermatologist for a diagnosis. According to the NPF, up to 50 percent of people with psoriasis and at least 80 percent of psoriatic arthritis sufferers experience changes in their nails. Check for thickening, pitting, ridging, cracking, discoloration, deformation and onycholysis (separation from the nail bed).